I teach "Easy Dye" silk classes and COLORHUE is my favorite go-to dye! Students of all ages are thrilled with the results, the colors, the soft hand of the silk and above all, the EASE of creating their own beautiful silk scarf with no expensive equipment! Using COLORHUE dyes is easy, fast and efficient because they require no setting procedures, such as timing prerequisites or heat processes in order to complete the coloring. This dye does not require powders to mix or any additional chemical additives to augment the liquid dye. The only additive needed is plain tap water to dilute the concentrated liquid colors. So many beautiful results can be achieved with these dyes! A few drops in a half cup of water is all that is necessary. Adjusting the water amounts adjusts the strength of the colors. The technical: COLORHUE instant-set silk dyes are true coloring agents that penetrate the fibers of your silk. Textile dyes are coloring agents that bond with the fibers of your fabric. They are soluble in water and will not effect the feel of the fabric. Safe and non-toxic. Suitable for kids. 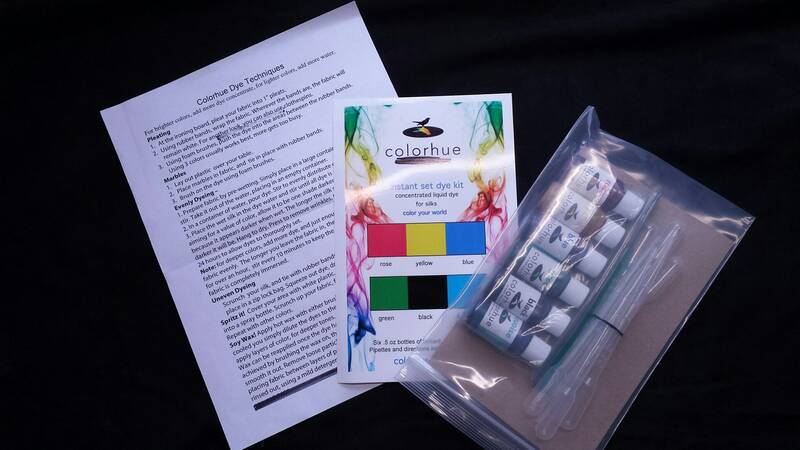 * $39.00 : The Dye kit with Six .05 oz of concentrated liquid colors, (Yellow, Blue, Green, Turquoise, Black and Rose.) Also included are instructions, 6 pipettes and 6 stir sticks. * $46.00: The Dye kit and 1 silk scarf 8" x 72" silk scarf for you to jump right in and create your scarf! These scarves are made of high quality silk and not available from most suppliers! Policies Payment Custom orders over $300.00 can be broken down into payments. The order will ship when the last payment is made. Just ask for details! Policies Shipping Shipping is usually through the US post office. Large paintings ship through Fed Ex. Policies Refunds For custom orders, you'll receive a digital image and your approval before shipping. They are always more beautiful in person!